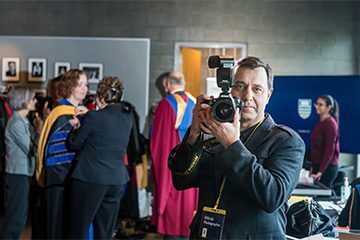 From UBC President and Vice-Chancellor Santa Ono to important visitors and outstanding staffers, Paul Joseph has met—and photographed—them all. “This place has some amazing personalities, all the way from the top, down to the guy who runs the UBC composting facility,” Paul enthuses. Perhaps one of his most high-profile—and stressful—assignments to date was the September 2016 UBC Okanagan royal visit. 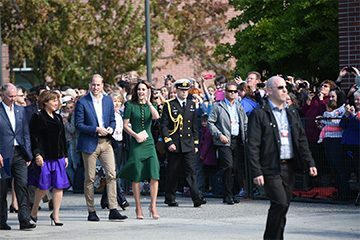 Paul was tasked with capturing candid images of the Duke and Duchess of Cambridge (aka Prince William and Kate Middleton) on their tour of the UBCO campus. He recalls how he, along with press photographers, were subjected to careful scrutiny by the Royal Canadian Mounted Police (RCMP). Paul captured the royal visit to UBC Okanagan in 2016. As for the royals, Paul says, “their faces came alive when interacting with people on the route. And when a small group of Indigenous children came to present a gift to them, their faces just lit up.” Because of the high-profile nature of the event, Paul was under pressure to send in his photos as quickly as possible, to be shared on UBC’s social media channels. But even when he’s not dealing with royal visitors, the demands of the job can be pretty gruelling. Pointing at the step counter on his smartphone, Paul notes that he recently walked 12 kilometres on a single day. After high school, Paul was accepted into three different universities to study psychology—but when he received his acceptance from Ryerson, he didn’t hesitate. “It was a no-brainer,” he laughs. While he didn’t end up studying psychology, Paul agrees that his job does require him to be adept at understanding people and their emotions. Use the Rule of Thirds: Imagine your picture is divided into a grid of three lines each horizontally and vertically. When framing your picture, place the subject where they most closely align with the intersecting lines—typically, leave two-thirds of the photo with background or foreground. Allow for negative space. Remember the words of photographer Robert Capa: “If your photos aren’t good enough, then you’re not close enough.” Don’t be afraid to get close to your subjects, and try different angles.” When photographing children, get down on their level; when photographing adults, try shooting from below and above to create a more interesting shot. If you want to isolate your subject, use a longer lens to let the background fall out of focus. Including an element that is closer than the subject, like the edge of a pillar or wall, can add the sense of peeking into a scene.